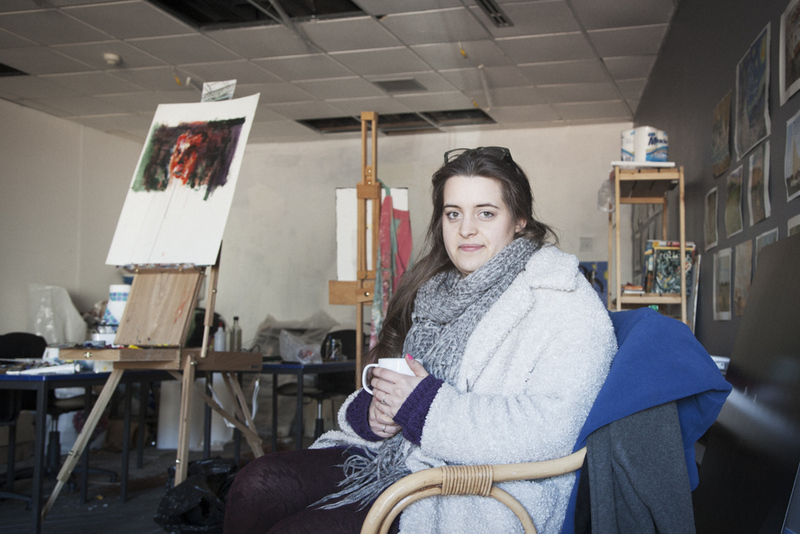 For the last twelve months local artist Harriet Lawson has been an enthusiastic participant of The Faculty, a professional development and mentoring programme for artists set up by Creative Scene and its northern partners. “How has The Faculty changed you?” I ask. “So it’s given you permission to be an artist?” I suggest. Harriet, I know, is being characteristically modest. 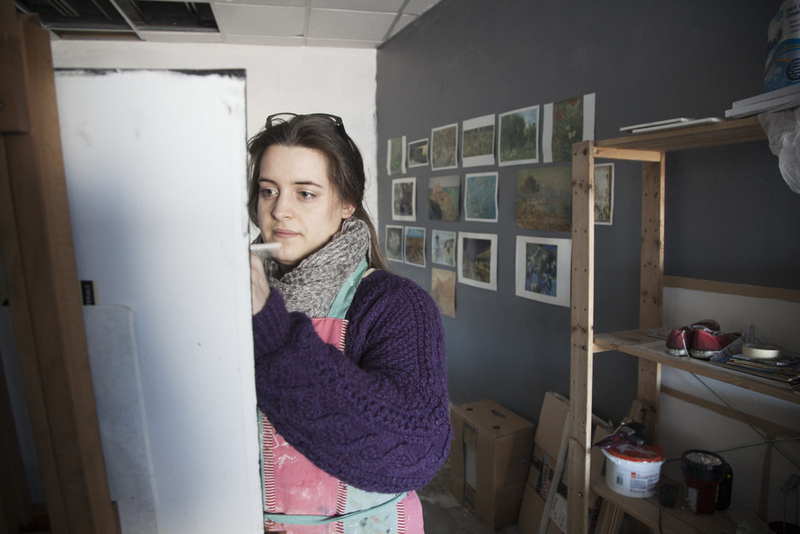 In the time I have been writing about her own personal artistic development she has not only brought other artists together for weekly art interventions around town but has also set up a successful partnership with fellow artist, Ruth Bridges. The duo are up for an O2 Think Big award at a swanky do in London next month. “Is that where you leave a penny in place of the rubbish?” I can’t keep up with all their projects and ideas. Harriet and her fellow artists reconvene for the afternoon session. 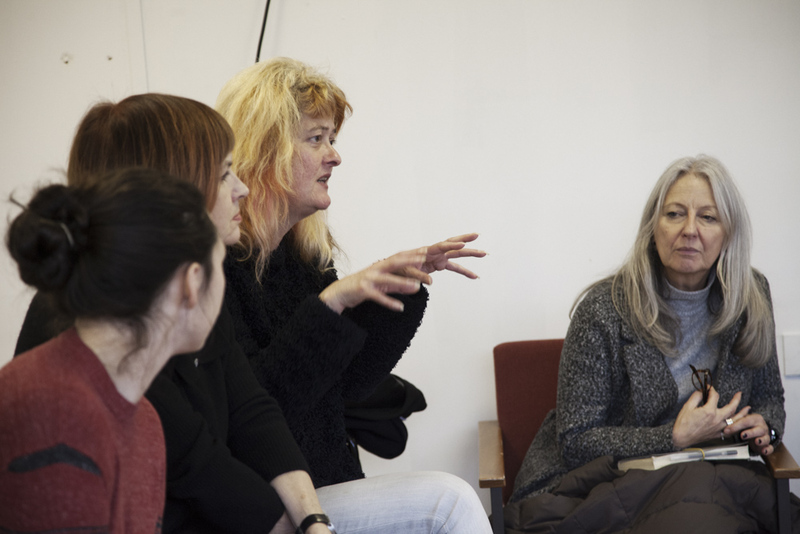 Today they’re meeting with the directors of the four Creative People and Places (CPP) programmes that established The Faculty. “The Faculty has very much been an experiment for us,” says Patrick Fox from Heart of Glass in St Helens. “What’s really been interesting is seeing the power of the network you’ve created, the critical mass of people sharing ideas but also demanding more. Harriet is not alone. None of the participants see today’s meeting as an ending. There’s talk of how to continue with some informal networking to keep the group together. And Jenny Rutter from Left Coast in Blackpool and Wyre encourages everyone to attend the one-day professional development workshops scheduled. 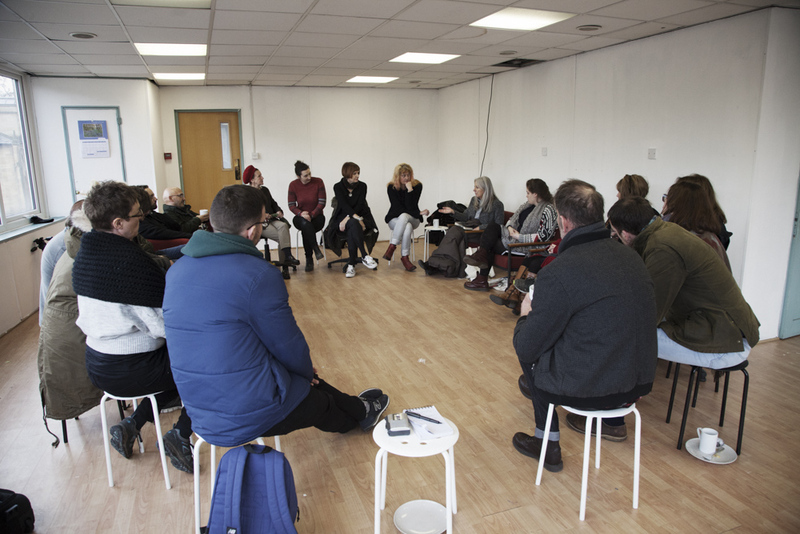 With a room full of socially-motivated artists, talk of the political landscape is not far away. 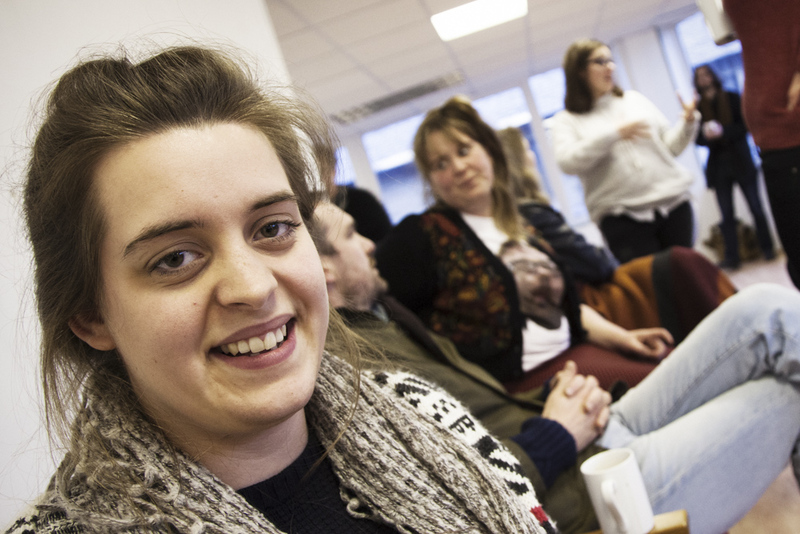 There’s concern that, because of local authority cuts, many practitioners are finding themselves working in vulnerable communities with little or no support from other professionals. Like so many others, these practitioners are feeling their way through unfamiliar scenarios. Old models of community engagement won’t necessarily fit any more, despite the need for artistic interventions being greater than ever. I look forward to following Harriet’s journey as she navigates this new terrain. The Academy professional development workshops continue in Blackpool from now until March. It looks like a production line to make goodie bags for a children’s party. 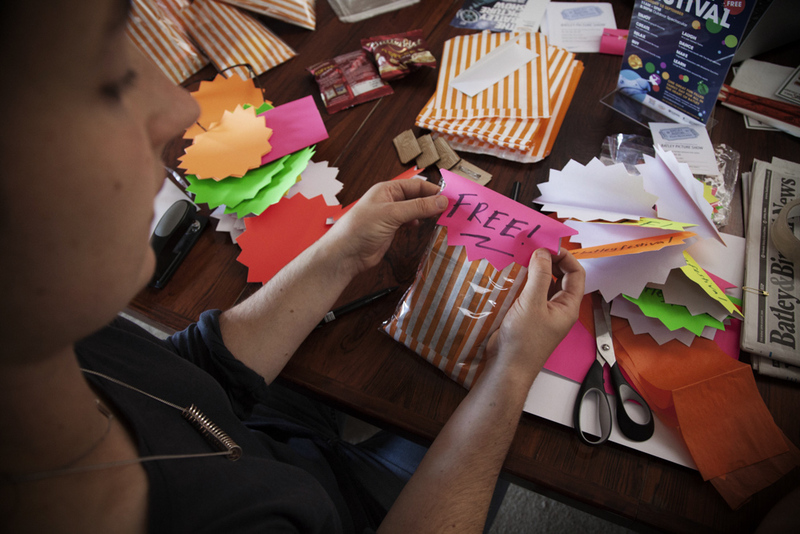 The long table in Creative Scene’s office is full of stickers, coloured card, small gifts and a pile of orange stripy paper bags. The fifth annual Batley Festival is only a couple of weeks away. Leaflets have been distributed and social media is abuzz. Local artists Harriet Lawson and Ruth Bridges from Dewsbury Free Art Fridays have been invited to add to the build-up, which explains the crafty cacophony. 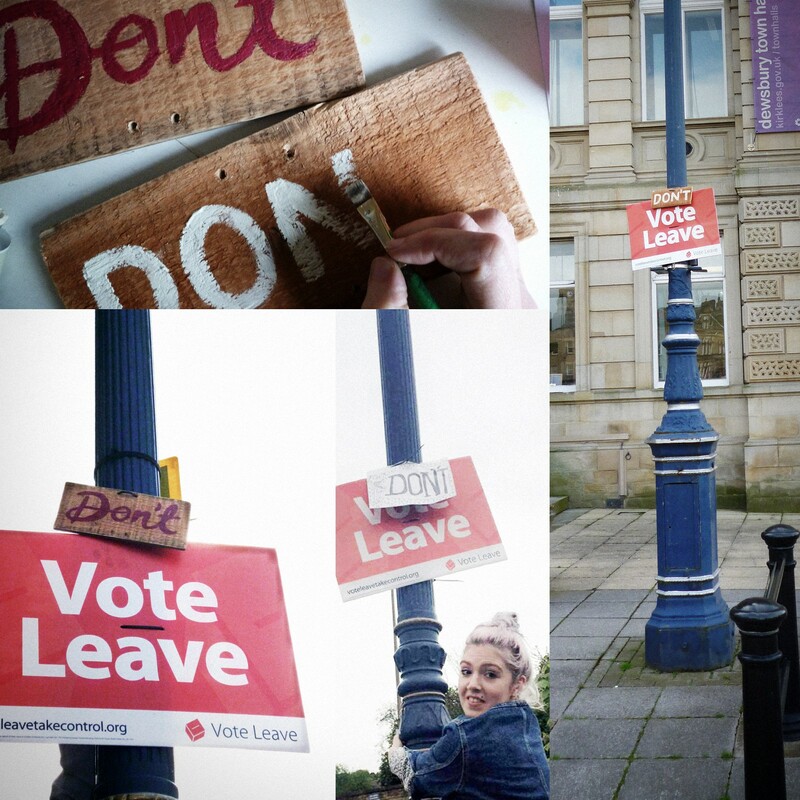 I last met the artists a couple of months ago as they were planning to shinny up lampposts. Since then their playful art intervention has included replacing Dewsbury’s litter with coins and Olympic-inspired medal making. 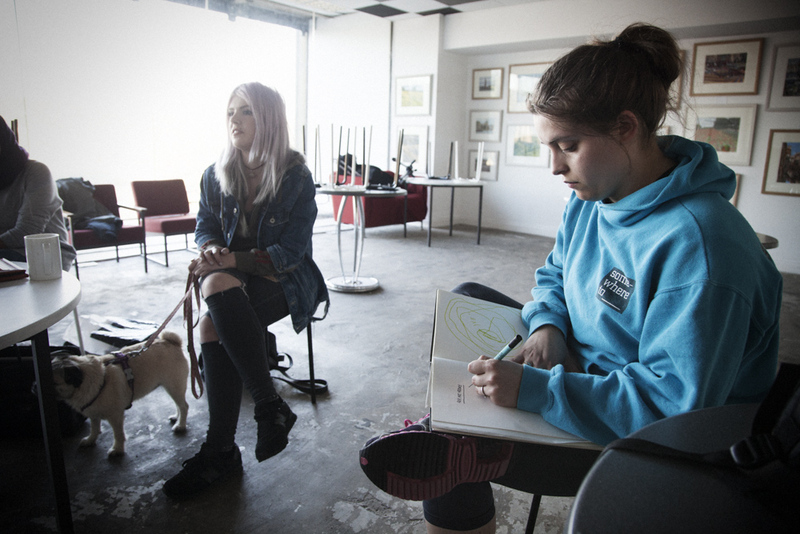 She and Ruth are both graduates of the Creative People and Places artists’ professional development programme. 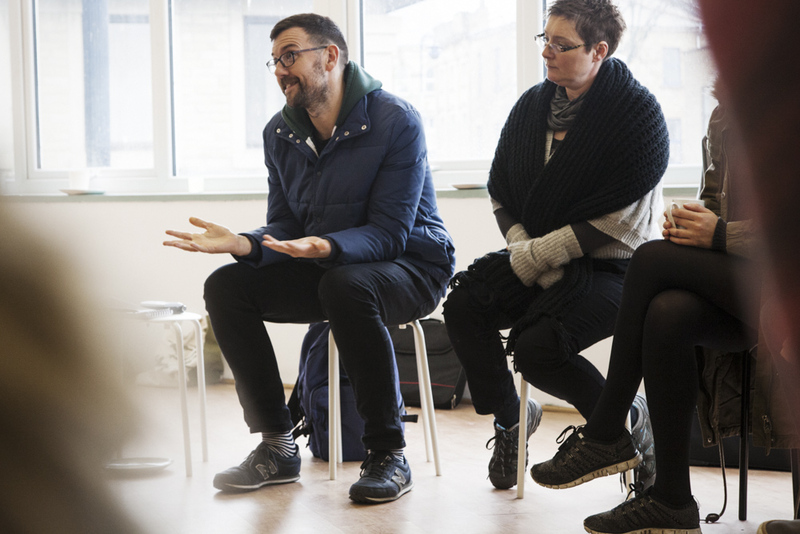 The Faculty brought together emerging artists across the North to encourage debate and new thinking around social arts practice. The strategy is paying off. Their ‘real-temporary’ tattoo workshop has already been a huge success at an arts festival in Morecombe and is booked for other ‘gigs’ too. “So, what have we got here?” I ask, eyeing a laser-cut wooden badge. 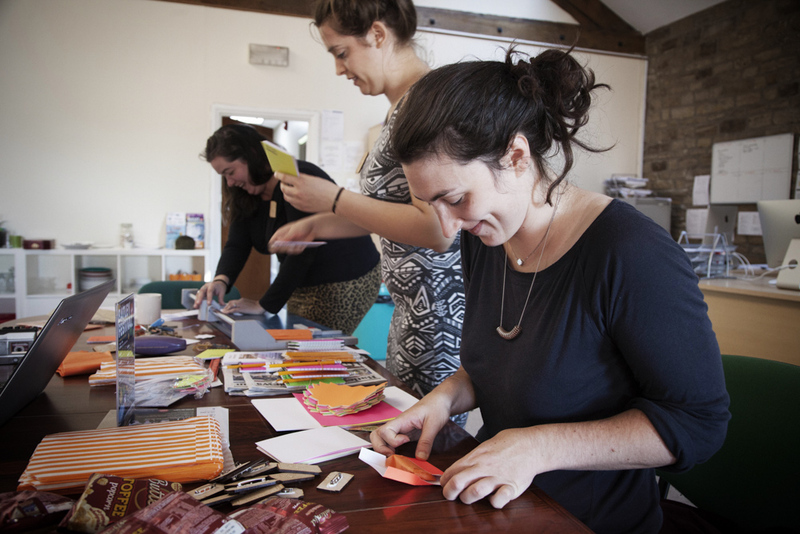 Harriet wraps a notebook and pencil to make a ‘reviewer’s pack’; Ruth adds some leaflets and a bag of toffee popcorn and Rebecca puts it all together in a stripy bag. Soon we have 20 bags of arty goodness to give away. In Batley’s Market Square we decide to split up. Rebecca and Ruth head towards the library and Harriet eyes up the Town Hall as we set off in the opposite direction. A man on a ciggy break clocks the first bag going up above a noticeboard and asks what we’re doing. “They’ve been a lot coming in the Town Hall asking about it,” he says, once we’ve filled him in. Buoyed by his enthusiasm, Harriet strides past a bookies and a mini market to leave a bag in the doorway of an empty shop; another under a bench and a third amongst a display of bedding plants. This is what Free Art Fridays is all about: little bundles of art left for members of the public to stumble upon and enjoy. There’s another on a window ledge and on the pavement outside a barbers. “I’m tempted to leave one in the ladies,” Harriet says as we reach The Taproom pub. And she does. We walk together back up Commercial Street. “Two of mine have already gone,” she tells the others as we reconvene. Within 20 minutes Rebecca is checking her computer back in the office. “Someone’s already posted one!” she exclaims as we crowd around her screen to see one of our bags with its new owner. Instant success. On Friday, 2nd September Harriet and Ruth will be running workshops for young and old at Batley Tesco from 11am-2pm to make film-related props for the Festival. 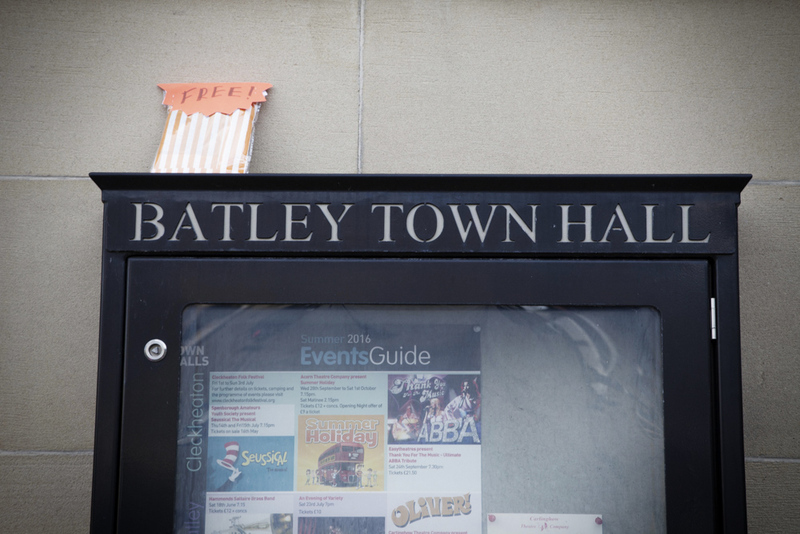 Batley Festival – one great, fun-filled family day for all in the heart of Batley – is on Saturday, 10th September, 11am-5pm with The Batley Picture Show at 8.30 in Memorial Gardens. 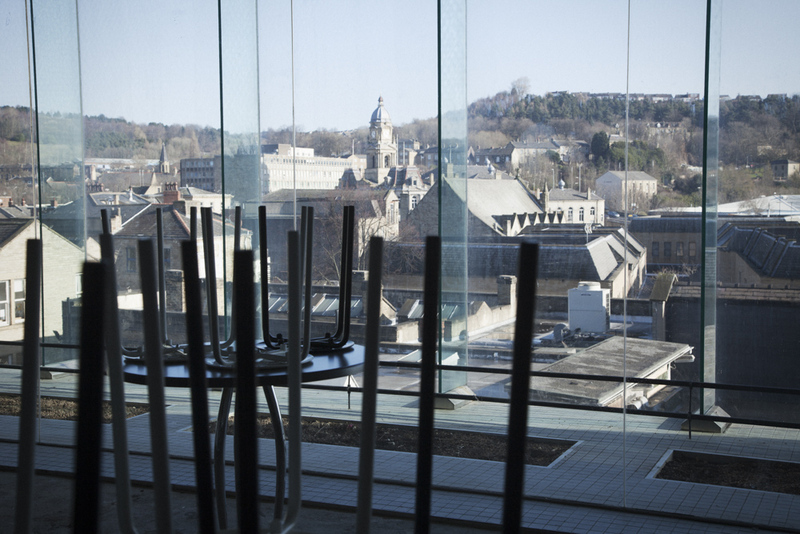 Harriet’s studio has a great view over the Dewsbury rooftops. Today the West Yorkshire town is looking resplendent in the February sunshine, but the top floor of this shabby office block is as cold as the shopping street we’ve just left. “Quite milky for me please,” I say, eager for a warm drink. At the end of last year, in her SceneMaker role, Harriet helped out with Creative Scene’s There Will be Fire extravaganza at Crow Nest Park learning from outdoor fire experts Pa-Boom how to bring Dewsbury’s park and lake to life for thousands of people. “Did it work?” I ask, cheekily. Only this week Harriet has been accepted onto Creative Scene’s Faculty professional development programme. 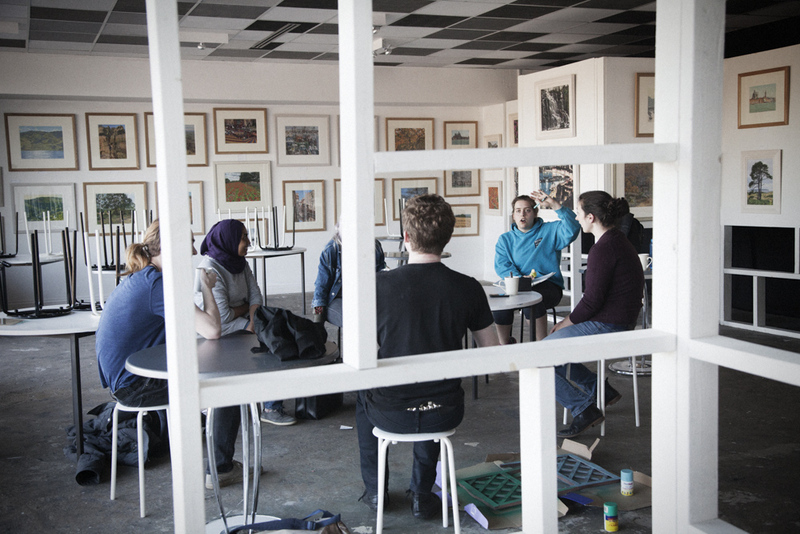 It’s a joint venture with other Creative People and Places projects across the North West, aimed at artists and creatives passionate about their social arts practice who wouldn’t normally get the chance to take part in higher education or a masters course. She’s looking forward to learning from others in similar towns and bringing new ideas back to Dewsbury. I can’t help but be impressed by her enthusiasm and vision. “I think good things happen when creative people get together,” she says. “It’s exciting, isn’t it?” I say, finishing my tea and reaching for my camera. Harriet’s work is on Facebook and YouTube.